Whilst in Gold Run today, I happened upon a "train meet" between UP 7834, a brand new Union Pacific General Electric ES44AC (the newest fuel-efficient and "greenest" locomotive from GE, an AC-powered unit with 4,400 horsepower) and Amtrak's #5 (westbound) California Zephyr, powered by GE P42DC (4,250 horsepower, DC-driven, manufactured in October of 2001) #206 on point. From where I stood, just after #5 passed by westbound on the #1 track, UP 7834 hauled by and acknowledged my presence with a nice horn series -- thanks. Here's a video of UP 7834. 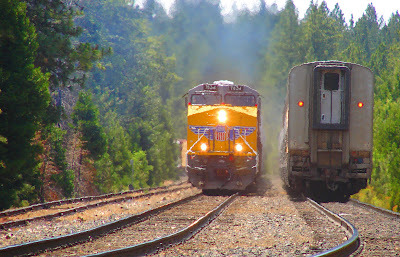 The new GE ES44AC sported pristine armour-yellow UP paint (that won't last long running through the tunnels over Donner Pass) and was followed by UP # 6439, a GE AC4400CW (AC-driven, 4,400 horsepower). Capturing a train meet on film or video is a rare event indeed, completely subject to the whim of the variables involved. While it was 99 degrees in Sacramento, it was 80 degrees in Gold Run. 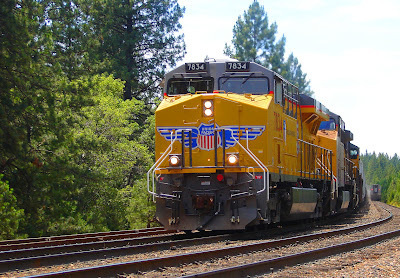 Recently, UP has been running a lot of GE equipment on the head end up and down Donner Pass on the #1 and #2. I caught this photo in Gold Run, of a GE C44ACCTE -- UP's description of an AC-driven General Electric unit with 4,400 hp, possessing CTE or Controlled Tractive Effort. Gold Run has been the subject of a new tie test project, where older wooden ties have been replaced with composite ties. In the first heat of the 2008 mountain season, the lead unit is in focus whilst the rest of the mixed manifest blurs out in heat lines.